In a global context of erosion of biodiversity, the current environmental policy in Europe is oriented towards the creation and the preservation of ecological networks for wildlife. However, most of the management guidelines arose from a structural landscape diagnostic without truly taking into consideration species’ needs. 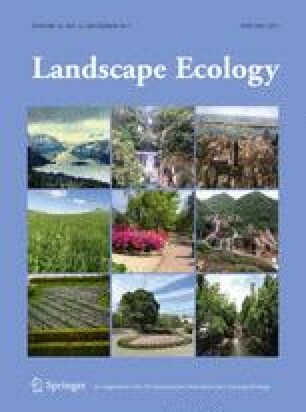 We tested whether and how landscape elements influence the functional connectivity of landscapes for a forest specialist species, the European pine marten (Martes martes), in Northeastern France. We collected pine marten scats and tissues from 13 evenly distributed study sites across the whole study area in order to test several types of barriers such as highways, waterways, and open agricultural fields. We crossed the results of several methods: spatial autocorrelation analysis, causal modelling framework, and clustering methods. The study indicates significant genetic differentiation among the sampling sites. A signal of isolation by distance was detected but disappeared after partialling out landscape or barrier resistance. The only model that was fully supported by causal modelling was the one identifying waterways as the main driver of genetic differentiation. Moreover, clustering analyses indicated the presence of genetic clusters, suggesting that pine marten spatial genetic pattern could be explained by the presence of waterways but also by their reluctance to cross open fields. The current ecological network could thus be improved by increasing permeability of waterways, in particular navigation canals, and by maintaining and restoring forested corridors in agricultural plains. This study has been funded by the Regional Concil of Champagne-Ardenne, by the University of Reims Champagne-Ardenne (URCA) through In Situ research program, by the French system of transmission system operators for electricity (Réseau de Transport Electrique, RTE), and by the Regional natural park of Avesnois. Data used in this work were partly produced through the technical facilities of the Centre Méditerranéen Environnement Biodiversité and of the Laboratoire des Pyrénées et des Landes. We thank all people who collaborated for samples collection and especially all hunters and trappers. We are also grateful to Eva Bellemain (SpyGen) for discussions on how to improve DNA amplification. Finally, we would like to thank Bertrand Gauffre and the two reviewers for comments that greatly improved the manuscript. The Regional Concil of Champagne-Ardenne and the University of Reims Champagne-Ardenne through In Situ research program.